I learned after I picked this one up that it is actually an imperialized version of Laurelwood’s Green Elephant IPA. Had I known I would have grabbed one of each, since I haven’t had the standard version. In any case, this comes from Laurelwood’s, “Imperial Series Limited Release,” and was hopped with Cascade, Ahtanum and Amarillo hop varieties (I’ve never heard of Ahtanum hops, which either means I’m utterly uninformed (likely) or they made it up). I can hear The Commander’s pounding from here. We’re talking like 3,000 miles away. NOTES: From a bomber in Sister McBrewin’s art cave. APPEARANCE: A nearly-clear amber with a hint of orange. HEAD: 2+ fingers of stolid parchment head, which stuck around for most of the pint. NOSE: Tangy hops, a little pine resin, citrus peel, and a bit of dirt (not an earthy note, but like good fresh dirt from a Pacific Northwest forest). TASTE: Based on the nose, this beer is much sweeter than I expected. Reminded me of 90 Minute IPA, though a little closer to being balanced. The green hop flavor and bitterness on the finish almost do the job, but just didn’t quite get there. DRINKABILITY: Pretty nice. If I ordered this at a brewery I hadn’t been to before, I would be pleased with what showed up. It’s not a show-stopper, but certainly falls into the “good beer” category. Two or three years ago I probably would have rated it a bit higher, but the average level of Imperial IPA quality has really risen recently, so I’m giving this one a solid 3 hops. *A caveat on the head and lacing comments: as I was away from my home tasting grounds I was forced to use whatever drinking vessel was available, which in this case was a plastic pint glass with a skeleton on the side. 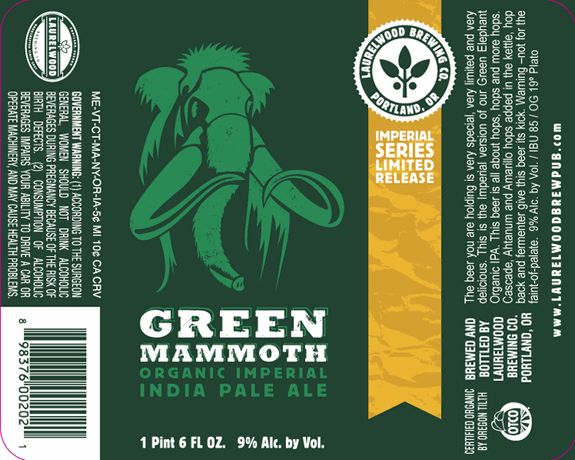 Posted in Tasting Notes.Tagged Green Mammoth, Imperial IPA, Laurelwood, Organic. I’ve seen Ahtanum usually mentioned as similar to cascade and a good substitute in homebrewing circles. We had the Green Mammoth at Roscoe’s IPA summit back in April. I largely agree with your assessment – appealing yet not memorable. Still I bought a bomber to bring home. I find Laurelwood a bit hard to pin down; there is a bit of TGIF atmosphere about their place on Sandy, but they have produced some memorable beers (sadly the Workhorse IPA is no more). Their PDX terminal bar is the best value in aviation; how many places can you buy bombers to go on the filight?